The battle for promotion out of League 2 took a big step towards resolution on Saturday, courtesy of Lincoln City's 2-0 win over MK Dons. Now with an 11-point gap at the top of the league with 15 points remaining, The Imps are almost assured the title and with it, League 1 football next term. That leaves two automatic spots still up for grabs. Asked if Dons were now out of the title hunt, manager Paul Tisdale said: "It seems like it... 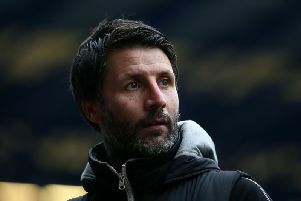 I'd imagine so," while Lincoln boss Danny Cowley was coy on admitting his side were all but up, though it could all be done and dusted at home to Cheltenham Town next week. With Dons now down to third on goal difference behind Mansfield, who they play on the final day, it means the battle for second and third looks set to go right down to the wire. Bury, who hit self-destruct with three consecutive defeats in a week, are now out of the top three, albeit a single point behind Dons, while Tranmere Rovers, who Dons play on Saturday, are just four points away. Not blown away by any stretch of the imagination, Dons lost to a penalty decision and a strike deep into second half stoppage time, just seconds after a stunning save from Matt Gilks to deny an equaliser for Chuks Aneke. A similar showing at Prenton Park will surely bear more fruit, while defeat will likely take fate out of their hands and thrust it into those of Bury and Mansfield. Tisdale added: "It was a really good game, I'm disappointed of course with the result but we have to move on to the next game. Five to go."